We’d love your help. Let us know what’s wrong with this preview of Conan Doyle for the Defense by Margalit Fox. In this thrilling true-crime procedural, the creator of Sherlock Holmes uses his unparalleled detective skills to exonerate a German Jew wrongly convicted of murder. One of USA Today's "Five new books you won't want to miss!" For all the scores of biographies of Arthur Conan Doyle, creator of In this thrilling true-crime procedural, the creator of Sherlock Holmes uses his unparalleled detective skills to exonerate a German Jew wrongly convicted of murder. For all the scores of biographies of Arthur Conan Doyle, creator of the most famous detective in the world, there is no recent book that tells this remarkable story--in which Conan Doyle becomes a real-life detective on an actual murder case. In Conan Doyle for the Defense, Margalit Fox takes us step by step inside Conan Doyle's investigative process and illuminates a murder mystery that is also a morality play for our time--a story of ethnic, religious, and anti-immigrant bias. In 1908, a wealthy woman was brutally murdered in her Glasgow home. The police found a convenient suspect in Oscar Slater--an immigrant Jewish cardsharp--who, despite his obvious innocence, was tried, convicted, and consigned to life at hard labor in a brutal Scottish prison. Conan Doyle, already world famous as the creator of Sherlock Holmes, was outraged by this injustice and became obsessed with the case. Using the methods of his most famous character, he scoured trial transcripts, newspaper accounts, and eyewitness statements, meticulously noting myriad holes, inconsistencies, and outright fabrications by police and prosecutors. Finally, in 1927, his work won Slater's freedom. Margalit Fox, a celebrated longtime writer for The New York Times, has "a nose for interesting facts, the ability to construct a taut narrative arc, and a Dickens-level gift for concisely conveying personality" (Kathryn Schulz, New York). In Conan Doyle for the Defense, she immerses readers in the science of Edwardian crime detection and illuminates a watershed moment in the history of forensics, when reflexive prejudice began to be replaced by reason and the scientific method. To ask other readers questions about Conan Doyle for the Defense, please sign up. What are possible lessons to be learned from this book? Margalit Fox is a witch. I don’t mean to suggest that she dances naked in the moonlight with the coven, though I’ve never met the woman, so I can’t opine definitively vis-à-vis her nocturnal pursuits. Rather, I can conceive of nothing short of sorcery to explain how someone could so deftly craft a narrative that appeals so strongly to my oddly compulsive interests as they pertain to Sherlock Holmes, Arthur Conan Doyle, Victorian history, culture, and society, unsolved mysteries, facial hair, and Margalit Fox is a witch. I don’t mean to suggest that she dances naked in the moonlight with the coven, though I’ve never met the woman, so I can’t opine definitively vis-à-vis her nocturnal pursuits. Rather, I can conceive of nothing short of sorcery to explain how someone could so deftly craft a narrative that appeals so strongly to my oddly compulsive interests as they pertain to Sherlock Holmes, Arthur Conan Doyle, Victorian history, culture, and society, unsolved mysteries, facial hair, and footnotes. It’s not simply the intermingling of these disparate elements that makes me suspect Ms. Fox of magic most foul, mind you, but also her admirable execution, which can only be explained by arcane forces (or perhaps just talent and competence beyond the comprehension of mere mortals). Conan Doyle for the Defense: The True Story of a Sensational British Murder, a Quest for Justice, and the World's Most Famous Detective Writer recounts the sensational 1908 murder of a wealthy, elderly woman and the bungled police investigation that followed, one that quickly homed in on a German Jew, Oscar Slater, who was then living in Glasgow (but soon to depart for greener, or at least techier, pastures in San Francisco), as the primary suspect. The strongest piece of “evidence” against Mr. Slater, a man about town who made his living in gambling halls and possibly through immoral housekeeping* (a charge he denied, incidentally), was a pawn ticket for a brooch that, in the general, matched the description of one taken from the scene of the crime. There was, however, one minor (read: gaping) flaw in this case-cinching piece of proof: the pawn ticket predated the murder/robbery by a few weeks, and, absent a time-tuner, the pawning of a piece of property tends to be rather difficult prior to acquiring it. Undeterred by the fact that logic, common sense, and even a semi-reasonable attempt to administer justice might undermine their case, the police pressed on, coaching numerous witnesses into identifying Slater as the guilty party. A weak defense lawyer, a prosecutor who treated facts as though he were auditioning to be President of the United States in the late 2010s, and a biased Victorian court combined to doom Slater to the gallows; only a last-minute reprieve (a result of the clearly shoddy case against him) provided a stay of execution, though it was decided that he would spend the next several decades doing hard time in Peterhead Prison. Enter Conan Doyle, the renowned creator of Sherlock Holmes and Victorian icon of manly commitment to honor, fair play, and absurd mustaches. Having been called upon to apply Holmesian principles of deduction (well, induction, but let’s not quibble over terminology) to solve real-life cases before (most notably in in helping Indian solicitor George Edalji escape from the clink after being falsely accused of maiming animals and correctly but irrelevantly being accused of not being white), Conan Doyle threw himself into the Slater case, having noted from the first that the chain of evidence couldn’t possibly support the police theory that Slater committed the murder. I’ll leave it for the far more talented Ms. Fox to present the facts as they unfold from there, but, suffice it to say, the Slater case has everything you could possibly want in a true crime story: shady suspects, bumbling police, red herrings, gross miscarriages of justice, conspiracies and cover-ups, celebrity advocates, and mustaches the size of ferrets. Fox does a masterful job of weaving all of those elements together, always quoting primary sources at just the right moment and referencing examples from the Holmes canon that mirror Conan Doyle’s approach to the Slater case. It’s a gripping narrative from start to finish that includes just enough social commentary and historical detail to help the reader realize just how emblematic of turn-of-the-century Britain the Slater trial was. It’s in providing that social commentary that Fox does perhaps her best work. The industrious and influential Conan Doyle, who was single-minded in his pursuit of honor and justice throughout his life, in many ways embodied the best ideals of the Victorian Age, though even he was not immune to the more unflattering aspects of the Victorian mindset, which included a patronizing and superior approach to anyone who wasn’t white and Christian. Fear of “the Other” is a frequent theme in Victorian (especially late Victorian) literature, and Slater, as both a Jew and member of the lower class, was, in many ways, the embodiment of that fear, despite his dapper appearance and facility with the English language. Fox doesn’t spare her cast of characters, not even Conan Doyle, from the painful truth of their own words, shining a light on the worst of their commentary, nor does she act as their apologist. But, she masterfully contextualizes that commentary in a way that helps the reader to understand what a progressive mindset looked like in 1920s Britain and how, even over the course of Slater’s decades languishing in prison, societal attitudes changed. It is a mark of progress if we look back over 100 years of history and cringe; I hope it is always thus. It speaks to desirable social evolution that many of the factors that contributed to Slater’s conviction (beyond the lack of systematic evidence gathering and logical approach to solving crimes, which a fictional detective did much to remedy) seem anathema to us now. Given enough historical distance, even the most noble individual may appear distressingly prejudiced (I mean, even Ross Geller seems like a raging homophobe in retrospect, and he once kissed Joey to help him prepare for an audition). Fox helps us realize this, even as she suggests that we’ve not made as much progress as we might like to think. I hope that in 2118, we’re living in a world where the rights of LGBTQIA people are not even remotely in question and racial and religious prejudice has receded to such a degree that they do not meaningfully impact one’s ability to live one’s life as one wishes, but the historical record suggests that we will still be fighting that good fight 100 years hence, I’m afraid. The moral of the story there is simply this: don’t make assumptions and don’t give up. Keep pushing us toward a better future. That unsavory aspect of humanity notwithstanding, CONAN DOYLE FOR THE DEFENSE is as absorbing a read as you’ll find in 2018. Highly recommended for Holmes fans, Victorian aficionados, true crime devotees, and mustache combs. Arthur Conan Doyle takes on the mantle of his own fictional detective, Sherlock Holmes, in the true crime case of an innocent man, German Jew Oscar Slater, convicted of the murder of the rich, elderly, unlikeable 82 year old woman, Marion Gilchrist in 1908, in Glasgow. Margalit Fox gives us a dense study of the true crime with her impeccable research, concentrating on giving us a social and political commentary of the era that allowed such a damning miscarriage of justice to take place. It is a Arthur Conan Doyle takes on the mantle of his own fictional detective, Sherlock Holmes, in the true crime case of an innocent man, German Jew Oscar Slater, convicted of the murder of the rich, elderly, unlikeable 82 year old woman, Marion Gilchrist in 1908, in Glasgow. Margalit Fox gives us a dense study of the true crime with her impeccable research, concentrating on giving us a social and political commentary of the era that allowed such a damning miscarriage of justice to take place. It is a time of baseless, offensive theories claiming that criminals were born, not made. As such, they make the unfounded assumption that foreigners, the poor, the working class, all outsiders, and Jews are all criminals, ironic given that evidence suggests the real killer is none of these. Conan Doyle challenges such bigotry with the more rational and forensic approach to ensure that almost 20 years later, Oscar Slater is freed from Peterhead prison. The police barely carried out an investigation, they had found a likely culprit in Oscar Slate, he indulged in gambling, lived with a prostitute, and travelled to New York within days of the murder. The fact that he had an alibi, bore no likeness to the man seen outside of Gilchrist's home, cuts no ice with the police. The policeman who queried his guilt loses his job as the police engage in outright deception and lies that ensures Slater is found guilty. Slater asks Conan Doyle for help in a message smuggled by William Gordon, a convict released in 1925. Despite not liking Slater, Conan Doyle continued to campaign until he was released. Slater displays little in the way of gratitude as he entered into a public spat with Conan Doyle on leaving prison. The police never pursued the real killer, despite evidence suggesting it was someone close to Gilchrist. Fox does not dwell in length on Conan Doyle, giving us his personal history and his campaign to free Slater. She is much more interested in the anti-semitism, racism and demonisation of the poor in the period, encapsulated in the credence given to quack theories that justified this appalling state of affairs. I found this a compelling and interesting read of this true crime and the depiction of a corrupt police force is forcefully related. It is to his credit that Conan Doyle had an interest in justice and prepared to fight the establishment when it came to Slater. Many thanks to Serpent's Tail for an ARC. Arthur Conan Doyle is, of course, best known for writing Sherlock Holmes, but he was also a man of many interests. By the time of the events of this book, Conan Doyle was well known as a crusader for justice; although he was also somewhat derided for his passion for Spiritualism. However, if you are reading this book solely for your interest in Conan Doyle, then please be aware that this is largely about the historical true crime case, which occurred in Glasgow, 1908, and the events which follow Arthur Conan Doyle is, of course, best known for writing Sherlock Holmes, but he was also a man of many interests. By the time of the events of this book, Conan Doyle was well known as a crusader for justice; although he was also somewhat derided for his passion for Spiritualism. However, if you are reading this book solely for your interest in Conan Doyle, then please be aware that this is largely about the historical true crime case, which occurred in Glasgow, 1908, and the events which followed it. The book does include Conan Doyle’s part in these events, but there is much more besides. The case of Oscar Slater, a German Jew, who was cosmopolitan and well travelled, was certainly to regret his visit to Glasgow. In what was later termed, “the Scottish Dreyfus Affair,” Slater was arrested for the murder of an elderly widow, Marion Gilchrist, just before Christmas in 1908. This miscarriage of justice is more interesting, in part, because Slater himself is not a particularly sympathetic character. He was, in fact, a rogue, or ‘blackguard,’ in Conan Doyle’s opinion. However, the evidence against him was circumstantial and when he was sentenced to life ,with hard labour ,at the notorious Peterhead Prison, he began to lose hope. Conan Doyle was interested in the case from the beginning, but a smuggled message from Slater in 1925, led to him becoming involved in trying to gain Slater’s release. It is more commendable that Conan Doyle worked on Slater’s behalf, considering his original low opinion of the man – it was justice that mattered and he threw himself into the investigation of the crime. This is a fascinating account of the crime, the background, original investigation and Conan Doyle’s own investigation. It is somewhat shocking to realise how long Oscar Slater spent in prison before his release; which may never have happened without Conan Doyle’s help. At times, it seems the author wanted to put in every piece of research. However, this is still a fascinating account of a historical true crime and the outcome for the man convicted of it. I received a copy of this book from the publisher, via NetGalley, for review. A wealthy, and extremely paranoid elderly woman is brutally murdered in her home. Clues that would prove to even the untrained to be blatantly false lead the police to a suspect, Oscar Slater - immigrant German Jew with a shady reputation. Slater finds himself imprisoned for a life of hard labor in one of Scotland's worst prisons...barely escaping hanging for the crime. After 18 and a half years, and close to suicidal, Slater manages to get a cry for help out....to Sir Arthur Conan Doyle. A well known crusader for justice, despite the blows to his reputation concerning his fascination with the afterlife....and a faked photograph of "fairies", Doyle takes on the case....applying the same investigative tools used by his fictional creation, Sherlock Holmes. Battling the rabid anti-Semitism and anti-immigration bias that gripped Scotland, and the entire British Isles at the time....along with a police department and prosecutors more willing to frame a man on questionable circumstantial evidence rather than find the real perpetrator, Doyle would spend his final years seeking justice, finally freeing Slater in 1927. A remarkable work of biography, history and true crime that captures the time and place that this travesty of justice occurred, and revealing the honorable man Doyle was, along with the innate genius for deduction that he was blessed with, a genius that lives on in his most famous creation. Overall, a highly recommended read...for Doyle fans, Holmes fans, history buffs and true crime aficionados everywhere. I think a 3.7 is about right for this book. It's interesting for sure, but there's a lot here that could have been bypassed to make it flow better and give it more strength. In 1908, 82 year-old Marion Gilchrist of Glasgow was severely beaten to death in her flat. All that was missing was a crescent-shaped diamond brooch, and police sent out a warning to the "Pawns" to be on the lookout. Four days later, a bicycle dealer revealed to the police that he knew a man who'd been trying to sell a pawn I think a 3.7 is about right for this book. It's interesting for sure, but there's a lot here that could have been bypassed to make it flow better and give it more strength. In 1908, 82 year-old Marion Gilchrist of Glasgow was severely beaten to death in her flat. All that was missing was a crescent-shaped diamond brooch, and police sent out a warning to the "Pawns" to be on the lookout. Four days later, a bicycle dealer revealed to the police that he knew a man who'd been trying to sell a pawn ticket for a brooch matching the description of the stolen one. It wasn't long before detectives honed in on the man with the ticket, a certain Oscar Slater. The police became focused on this man, believing they had the right guy since, after all, he was already a man of interest and on their radar -- he was reputed to be a pimp, a petty criminal, and they also discovered that Slater was on his way to America with his girlfriend. He was picked up, arrested, and held in New York City, but agreed to be extradited back to Scotland to prove that he was not guilty. In the meantime, the brooch that had been pawned turned out not to have been the one stolen from Miss Gilchrist; the Glasgow police, however, were certain that they had the right guy, and explored no other avenues, leaving out any other possible culprits and dismissing testimony from people who could have exonerated Slater. The case, which came down to some pretty iffy eyewitness identification, went to trial; in May, 1909, Slater was found guilty and sentenced to death, with sentenced commuted to hard labor for life. The story might have ended there, but in 1912, Arthur Conan Doyle was asked to take a look at the case, which he did using the same sort of logical, rational approach he had imbued in his creation Sherlock Holmes to go over the particulars of the Slater case in order to try to redress the huge miscarriage of justice that had occurred three years earlier and sent an innocent man to prison. The questions at the heart of this story concern two main issues. One, why was it that the police, knowing that there was nothing but some pretty dubious eyewitness testimony to connect Slater with the Gilchrist murder, continued to pursue the case against him, and two, given that factor, how could the trial culminate in a guilty verdict that carried a death sentence? Fox slowly takes us through the circumstances of Slater's case and its aftermath; around these events she puts us squarely in a "watershed moment" in which these events occurred, straddling "the twilight of nineteenth-century gentility and the upheavals of twentieth-century modernity," at a time when science and the scientific method were starting to take a more central role, especially in the area of forensics. However, this was not a case where police decided to rely on logic and reason. The Slater case may not be as well known as the Edalji case, the basis of the novel Arthur and George by Julian Barnes, so this book is good mainly for people who may be interested to learn about Conan Doyle outside of his role as the "creator of the most famous detective in the world" and as a man with a "code of honor" who more than once refused to let justice take a wrong turn and affect innocent lives. But beware -- I've read three or four biographies of Conan Doyle since I read this book, and I don't completely agree with Fox's conclusions about the man himself, in which she sort of glosses over more than a few facts. I'll refer you to Russell Miller's The Adventures of Arthur Conan Doyle and Out of the Shadows by Georgina Doyle for further reading. And while personally I think that there's a lot that could have been edited out without any detriment whatsoever to this story, one of the strengths of this book is that the author has managed to place her study meaningfully into the context of that "watershed moment" mentioned above, socially, culturally, and scientifically, rather than just rehashing the bare bones of the case. While the blurbers call this book a "thrilling true-crime procedural," I wouldn't go that far, but it is a story that speaks to our own contemporary concerns not only about "the racialization of crime" but also about some pretty shady practices in law enforcement and the justice system which all too often ruin the lives of innocent people. This book was chock full of Sir Arthur Conan Doyle information. The Sherlock Holme's author was a true "gentleman". He had his principles and he stuck to them. I loved this book --if you are a Sherlock Holmes and true crime fan this book was written for you. It details the horrifying injustice done to Oscar Slater when he is wrongly found guilty of murdering a wealthy older woman he never even had heard of. ACD (along with a few others)helps to get Oscar out of his torturous prison cell in Peter This book was chock full of Sir Arthur Conan Doyle information. The Sherlock Holme's author was a true "gentleman". He had his principles and he stuck to them. I loved this book --if you are a Sherlock Holmes and true crime fan this book was written for you. It details the horrifying injustice done to Oscar Slater when he is wrongly found guilty of murdering a wealthy older woman he never even had heard of. ACD (along with a few others)helps to get Oscar out of his torturous prison cell in Petershead... but this book is much more then just that. The anecdotes about ACD were very interesting. I recommend this book to history buffs most especially. In 1908, an elderly lady, Miss Gilchrist, was bludgeoned to death in her Glasgow home and a brooch was stolen. Shortly afterwards, Oscar Slater pawned a brooch and boarded a ship bound for America. These two facts were enough for the police to decide that he was the guilty man and, sure enough, they arrested and charged him, and he was convicted and condemned to death – a sentence that was swiftly commuted to life imprisonment in response to a growing feeling of doubt over the verdict among some sectors of the public. This book sets out to tell the story of the case and specifically of Arthur Conan Doyle’s involvement in the campaign to have the verdict overturned. Quite often with this kind of book I avoid mentioning the eventual outcome as, even though it’s a true crime, it can be fun for people who don’t know the story to read it as a kind of suspense thriller. However, Fox reveals all in her introductory chapter, so I shall say now that Slater’s conviction was finally quashed, but not until he had spent nearly twenty years in Peterhead, Scotland’s most notorious prison. As the book shows, there is no doubt about his innocence, and Fox makes no attempt to pin the crime on the real culprit – that’s not her purpose. Instead, she uses the case to examine the social factors that led to the false conviction, together with the state of the science of detection and ACD’s influence on it. Fox starts with a description of the murder and the vague and contradictory eyewitness accounts of a man, or perhaps two men, seen near the scene. The police were immediately under pressure to find the murderer, so they were delighted when they were told that Slater had pawned a brooch similar to the one which had been stolen. Slater was perfect as a villain – German, Jewish, a man who made his living from gambling and who lived with a woman suspected of loose morals, possibly a prostitute. So even although they quickly discovered that the brooch he had pawned was not the one stolen from Miss Gilchrist, they decided not to let this little fact get in the way. Instead, they carefully selected all evidence that made Slater look guilty and suppressed anything that proved his innocence – and there was plenty, including an eyewitness account from a respectable neighbour who saw him elsewhere at the time. Fox discusses the growing anti-Semitism of the period in Scotland, and the more general fear of foreigners. While Scotland hadn’t been quite as anti-Semitic as England in the past, massively increased immigration was leading to an upsurge, especially since many of the Jews arriving were poor, thus existing on the margins. They became associated in the public mind with crime. Also, new modes of transport and the requirements of an industrialised economy meant that people were more mobile than in the past, so that people didn’t necessarily know who their neighbours were, leading to a kind of fear of the stranger. So Slater was an ideal scapegoat, given that the police had no idea of the identity of the real murderer. Conan Doyle became interested in the case early on. Fox runs through those parts of his biography that are relevant to him becoming a kind of consultant on cases of wrongful conviction, such as his early exposure to the work of Dr Joseph Bell, the man who inspired Sherlock Holmes. Much of this was already known to me, but Fox keeps it tightly focused so that it never feels like padding. She coins the phrase “diagnostic imagination” to describe ACD’s methods, suggesting that his early medical training of conjecturing from symptom back to diagnosis was the basis for his technique of what we would now think of as forensic detection – using physical clues to work backwards to the crime. Fox discusses very interestingly how at this period the pseudoscience of “criminal anthropology” was still influencing detection in Scotland and elsewhere: a belief that one could determine criminal tendencies by certain physical hallmarks – a system “that sought to cloak racial, ethnic and class stereotypes in turn-of-the-20th-century scientific garb”. This was giving way to the more forensic methods promoted by ACD, but not quickly enough to save Slater. Fox continues the stories of both men turn and turn about, along the way providing a pretty damning indictment of the Scottish police and criminal justice system of the time. She personalises it by allowing us to read some of Slater’s correspondence with his loving parents and family, some of which is quite moving as they gradually age and his expectations of ever seeing them again grow fainter. During the war, no communication was allowed with Germany, so for years he went with no news of family at all. He wasn’t a particularly pleasant man, Slater, but the punishment he underwent for a crime of which he was innocent was cruel indeed. I found this a fascinating read, especially since rather to my surprise I learned quite a lot that I didn’t know about my own city and country. All the stuff about Glasgow – the class divisions, the way people lived, the prejudices and culture – feels authentic and still recognisable to this Glaswegian, and the wider picture of policing and justice in Scotland feels very well researched. The story of Conan Doyle’s involvement is also told well with lots of interesting digressions into the art and science of detection, and plenty of referencing to the world of Sherlock Holmes. One that I think true crime fans will thoroughly enjoy – highly recommended! NB This book was provided for review by the publisher, Profile Books. If you are like me, you probably only think of Sherlock Holmes when you hear the name Arthur Conan Doyle. I had no idea that he was like a real life Sherlock as well! When this book came across my desk for review I was immediately intrigued because the more I thought about it, I knew basically nothing about the man who created the world most famous detective. It actually makes sense that Conan Doyle was a real life detective, he obviously wrote with such authority on the subject that it’s embarras If you are like me, you probably only think of Sherlock Holmes when you hear the name Arthur Conan Doyle. I had no idea that he was like a real life Sherlock as well! It actually makes sense that Conan Doyle was a real life detective, he obviously wrote with such authority on the subject that it’s embarrassing that I didn’t put it together before. This book caught my eye and I immediately wanted to learn more about Sir Arthur Conan Doyle and how he played detective and ultimately wrote the most well known mysteries in history! I know I have said this before, but I think it’s worth mentioning again….I don’t read a lot of biographies but I absolutely love true crime (which I lately haven’t read as much as I would like). But this paired both biography and true crime together so I immediately knew that this wasn’t going to be another timeline style biography where we just hit the high and low notes in order and then be done with it. This book was much more than just a biography! This book examines social injustice, mystery, the legal system, and of course Conan Doyle himself. I loved reading about the early turn of the century justice system especially the miscarriage of justice done to Oscar Slater. While this book is full of Conan Doyle tidbits and facts, the details of the social prejudices and legal issues were fascinating to read about. This read more like a documentary than a biography. It was to the point and didn’t meander aimlessly. I read that the author used to write obituaries and I can see that influence here. She is brief, to the point, but also chooses her words carefully to add maximum impact for her readers. If you love true crime and you (like me) are a fan of Sherlock Holmes, this book was basically written for you. I loved reading this one much more than I was expecting! Sure it looked interesting and had an interesting cover, but initially I just thought it was going to be another biography…..I was so wrong. This book was exciting to read and really held my attention, not just a biography but something so much more interesting! This book – oh, so good! Here we're reading non-fiction, of course, but Fox's storywriting abilities make it come alive, to where it feels like I'm reading about a long-lost crime story that Sherlock himself solved. It's a thrilling read (definitely NOT drab textbook reading). It even leaves you on a cliffhanger at the end of a chapter sometimes, just because Fox could make you want more like that. The mystery itself is completely engrossing to learn about. And poor Slater, a man who would be sentenced for life – for a crime he certainly didn't commit – if only the police dunces would look at the facts straight! Their agenda was geared towards pinning a name on someone, but whether that was the actual murderer or not, it didn't matter. I realize now, more than ever, the truth behind Sherlock's hateful regard toward Scotland Yard, because apparently they were like that in real life, as illustrated in this book. Note to the discerning reader & parents: There are some references to prostitution, or having a mistress, though it was just facts and NOT obscene or distasteful. Contains some mild language. Overall? This book exceeded my expectations of it! I'd like to try the author's other books too. If you're a fan of Sherlock Holmes, DON'T MISS "Conan Doyle for the Defense"... and buy it for your Holmesian friends! “'Many men have been hanged on far slighter evidence,' Watson concurs. As a former obituaries writer for the New York Times, Margalit Fox has spent a great deal of time writing about death. (Her obit on the inventor of the plastic lawn flamingo is well worth the read and linked below.) While framed as a biography of Conan Doyle, this book really covers three separate but interrelated subjects: the great man himself, the unsolved murder of a wealthy spinster in Victorian Scotland, and the life of Oscar Slater, a German Jew who was falsely accused of the crime and incarcerated for decades in horrific conditions. Finally, Margalit spends quite a bit of time reconstructing the life and psyche of the accused. Oscar Slater (not his real name) grew up in relative poverty in a German Jewish family, but recreated himself into a man of the world who lived on his wits. In many ways, he is an unsympathetic character. He married a Scotswoman, then abandoned her and was living with an alleged prostitute at the time of his arrest. He was a gambler and possibly a pimp. After Conan Doyle spent decades publicizing the case and used his own funds and influence to have the sentence overturned, Oscar refused to pay him back and attacked Doyle in the press as "growing rich" off his case. In other ways, Oscar was incredibly naive and wrote doting letters to his mother and sisters from prison. If you are a reader who enjoys character profiling, there is a wealth of material here. I found Oscar to be somewhat interesting, but would have preferred more pages dedicated to Conan Doyle. 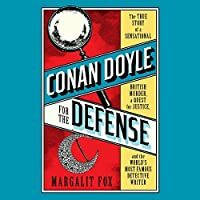 'Conan Doyle for the Defence' by Margalit Fox relates the tale of a clear miscarriage of justice. Oscar Slater, a Jewish immigrant, was convicted of the murder of Marion Gilchrist, a wealthy 82 year old spinster, who was found bludgeoned to death in her Glasgow home on 21 December 1908. An objective review of the evidence clearly demonstrates Oscar Slater’s innocence however, as Margalit Fox explains, ineffectual police techniques, police corruption, racial prejudice, and class stereotypes, all c 'Conan Doyle for the Defence' by Margalit Fox relates the tale of a clear miscarriage of justice. Oscar Slater, a Jewish immigrant, was convicted of the murder of Marion Gilchrist, a wealthy 82 year old spinster, who was found bludgeoned to death in her Glasgow home on 21 December 1908. An objective review of the evidence clearly demonstrates Oscar Slater’s innocence however, as Margalit Fox explains, ineffectual police techniques, police corruption, racial prejudice, and class stereotypes, all conspired to convict Oscar Slater in May 1909. Slater’s initial death penalty was commuted to penal servitude for life which he served at the harsh Peterhead prison. Arthur Conan Doyle was one of many who criticised the guilty verdict and the weak evidence against Slater. In August 1912, Conan Doyle published a booklet entitled The Case of Oscar Slater, where he suggested that some document, such as a will, and not the jewels, was the real object of the murderer’s quest. A Glasgow policeman named John Thomson Trench was also convinced that Slater had been wrongly accused. Trench was dismissed from the Glasgow police for his efforts to clear Slater, and he died a few years later. In 1927, supported by Conan Doyle, William Park published a book called The Truth About Oscar Slater. Slater's conviction was quashed in July 1928. Oscar Slater was finally released from Peterhead in 1927 after serving 19 years for a murder he almost certainly did not commit. He died in 1948. 'Conan Doyle for the Defence' contains a lot of background information about the case, attitudes to foreigners and criminality, police procedure, the penal system and much more. Occasionally this felt like too information, as though Margalit Fox wanted to include all her research, and from time to time I lost interest in what I was reading. With a good edit, this book could be a page turner, as it is it’s a generally interesting and exhaustive look at a case that allows exploration of an era when such an obvious miscarriage of justice could occur by virtue of the prevalent early 20th century attitudes. It also contains extensive biographical information on both Oscar Slater and Arthur Conan Doyle. There is more in this book about the philosophies and techniques of the Victorian era’s criminal justice system than there is about Doyle’s efforts to clear Slater. With the clarity of hindsight, she criticizes or applauds each move made by all the players. It was interesting, but not quite what I was expecting. We do get some about Doyle. Throughout were interspersed snippets about his public and private life. There were also interesting parallels drawn between the techniques Doyle used to clea There is more in this book about the philosophies and techniques of the Victorian era’s criminal justice system than there is about Doyle’s efforts to clear Slater. With the clarity of hindsight, she criticizes or applauds each move made by all the players. It was interesting, but not quite what I was expecting. We do get some about Doyle. Throughout were interspersed snippets about his public and private life. There were also interesting parallels drawn between the techniques Doyle used to clear Slater and the skills he showcased in the Homes stories. But it was more about the times than about his efforts. Fox traces the effects of the racial prejudices of the times and the effects of the faulty theories of criminology. She also takes issue with the morals of the times. Maybe it’s because she was focused on this terrible travesty, or it’s her writing style, but she seemed to broad-brush the entire era as being grossly unjust, despite the lengths numerous people went to in order to correct the situation. If you are interested in the evolution of the justice system in Scotland, this will be an interesting look at an incredibly influential case. Unfortunately, there were a couple of things that distracted me from the story. The first was the had-they-but-known style. It just didn’t work for me when we already knew what’s going to happen. We already knew things people did or believed had disastrous consequences for Slater and those helping him. I found it slightly annoying to have it pointed out over and over. More importantly, I had trouble following the storyline. Perhaps it was just the number of people and sources she was quoting from or the style, but there were large sections in which I had a very hard time following the chronology. She would follow one aspect for a while and then jump and tell us how it affects the ending and then jumps abruptly back to an earlier time. Sherlock Holmes uses extraordinary powers of _______________ to solve crimes. Apparently not. He uses “abduction” (Kindle location 1215). Abduction? Really? He kidnaps people? That can’t be right. I understand that Sherlock, if he decided to kidnap someone, would undoubtedly have extraordinary powers, what with being so brainy and all, but abduction, as the average hairpin understands the word, is definitely not in the canon. As it turns out, we have all been using the word “deduction” incorrectly all these years. Who knew? -- All murders are committed by undesirables. -- [name] is an undesirable. -- Therefore, [name] committed [unsolved crime]. This good book has a long but interesting digression into the names and characteristics of various types of syllogisms like above, and hangs it all on an interesting true-crime story of miscarried justice, so is generally my idea of a good time. I enjoyed reading it. Another long but interesting digression is the bigoted and baseless theories which passed for psychological profiling. I want to say that these theories are laughable, but they caused innocent people to go to jail and guilty people to go free, so I guess there isn’t really a lot to be jolly about. Still, a look at how the prejudices of another time deformed society and led to gross miscarriages of justice could, theoretically, aid us in looking with fresh eyes at the same problem in our era. Arthur Conan Doyle is actually only a supporting character in this book, and disappears for a long time as our somewhat-less-sympathetic real-life anti-hero does long hard time for a crime he didn’t commit. When he finally appears, he keeps the unjustly-imprisoned man at arm’s length, seemingly because he correctly read character, to wit, he (the wrongly accused) was a difficult cuss and did his utmost to make his already sad situation even worse. In short, a fun read by a good author, who has also written an interesting book about a completely different topic which I also paid for no money, read, and enjoyed, even though I wrote an ungrateful sorehead review at the time. Margalit Fox is mainly noted as a linguist, serving on many usage panels and boards for language usage handbooks. She also had a long career as writer of obituaries for the New York Times. But wait a minute. She didn’t just hack out death notices. Her tributes to the lives of celebrities and notables were classics. Her work was submitted twice for Pulitzer Prizes. “Conan Doyle for the Defense” is her third book and has prompted her retirement from the newspaper to concentrate on her book writing. I say, “Good decision.” This work is enlightening and engrossing than death notices. There are great historical references and informational tidbits about Sir Arthur Conan Doyle, the creator of Sherlock Holmes, the world’s most famous detective. But, in this case, it’s the author, Margalit Fox, who does the sleuthing. Fox’s in-depth research, her grammatically correct and precise writing, and her meticulous gumshoe efforts place Conan Doyle as the investigator instead of his famous detective. In the early 1900s, Oscar Slater, a German Jew expatriate, was convicted of the murder of Marion Gilchrist, who was found bludgeoned to death in her home. The evidence was shoddy, the Irish police investigation was comical, there were outright lies from prosecutors and police, and eventually class bias and anti-Semitism was proved to have influenced the guilty verdict. Conan Doyle tore down the case, step by step, and the decision was reversed, some 20 years after Slater’s conviction. This was the second of two such cases that Conan Doyle personally pursued, using his medical background and the rational inquiry approach he assigned to his fictional detective to get the convictions overturned. The author’s exhaustive research and carefully considered analysis shines a new light Conan Doyle’s techniques, so productive in the Sherlock Holmes series. It seemed to me, as I read Fox’s book, that her writing contains traces of Victorian and Edwardian literary styles. Literature during that period was noted for its intensity, imagery, and vision ... think Shaw, Hardy, Forster, H.G. Wells, and, of course, Conan Doyle. I felt a part of that time period as I read her book, making the account more rewarding and realistic. I enjoyed this great read. This would have made a great magazine article. Unfortunately, it was stretched to book length with irrelevant background and redundancy. Frankly, it only got good just after the halfway point. I would estimate that in the first 100 pages, only a dozen were actually about the "sensational British murder". The author also seemed to have an agenda of promoting a negative view of Victorian attitudes that got tiresome. Having said all that, the background on Conan Doyle and the small bits on the actua This would have made a great magazine article. Unfortunately, it was stretched to book length with irrelevant background and redundancy. Frankly, it only got good just after the halfway point. I would estimate that in the first 100 pages, only a dozen were actually about the "sensational British murder". The author also seemed to have an agenda of promoting a negative view of Victorian attitudes that got tiresome. This factual account of a man who was arrested and nearly hanged for a murder he did not commit could have been written in modern times except for the fact that forensic science had not yet been introduced. However, society's prejudices lead then to a shoddy police investigation and subsequent prosecution -- something that remains prevalent in modern society. This really needs to be made into a tv show! If you're like me and love reading fictional murder mysteries or true crime books, this is a must read as it offers both a fascinating plot and lots of little insights that I haven't read before. I've read a lot of Conan-Doyle, Agatha Christie and Robin Stevens books and I now have a new author to read. Thanks to netgalley for the chance to read this. A well-written book about an actual event in the life of Arthur Conan Doyle the author of many books about the famous fictional detective Sherlock Holmes. I thoroughly enjoyed all of the Sherlock Holmes stories ( I have read most of them several times) So this book intrigued me as it gave quite a lot of insight into the author of some of my favourite stories. I won't provide any spoilers but if you enjoyed the Sherlock Holmes stories you more than likely will enjoy this book. What a fascinating book. It delivers a true crime “mystery “ solved by the great Conan Doyle (creator of the famous Sherlock Holmes) presented within the social context of Victorian England. I enjoyed this very much - it was engrossing and certainly well-written. My thanks to NetGalley for providing me with an arc in exchange for my honest review. Margalit Fox’s CONAN DOYLE FOR THE DEFENSE is a fascinating look at the social and political world of late Victorian England. The book focuses on Arthur Conan Doyle’s efforts to free a man wrongfully imprisoned for a murder he did not commit. But what’s most interesting is the justice system in the early 1900’s, and how fraught it was with prejudice, especially anti-Semitism, class warfare, and distrust of foreigners. Sound familiar? Yes, it does. In 1908, a wealthy, elderly woman was brutally m Margalit Fox’s CONAN DOYLE FOR THE DEFENSE is a fascinating look at the social and political world of late Victorian England. The book focuses on Arthur Conan Doyle’s efforts to free a man wrongfully imprisoned for a murder he did not commit. But what’s most interesting is the justice system in the early 1900’s, and how fraught it was with prejudice, especially anti-Semitism, class warfare, and distrust of foreigners. Sound familiar? Yes, it does. In 1908, a wealthy, elderly woman was brutally murdered in her apartment. Several witnesses claim to have seen a man leaving the scene of the crime, and a pawned piece of jewelry led police to suspect Oscar Slater, a German Jew with a rather unseemly past (Conan Doyle himself called Slater “a disreputable rolling-stone of a man”). Police quickly latched onto Slater as the perpetrator, and he was ultimately convicted and sentenced to hang (a sentence that was later commuted to life in prison). Conan Doyle wrote several articles, as well as a book, about the miscarriage of justice resulting in Slater’s conviction, characterizing it as “a disgraceful frame-up, in which stupidity and dishonesty played an equal part.” And eventually, Conan Doyle’s involvement resulted in Slater’s exoneration and freedom. But it took almost 20 years. Fox describes late Victorian England as awash in social paranoia, including an intense distrust of foreigners, Jews, and the impoverished. In this environment, Slater seemed a likely target. He was German, a Jew, and a reprobate (he was a gambler, and he may well have been a pimp). He wasn’t, however, a murderer. He had no motive to kill the old woman, the pawned brooch wasn’t the one stolen from her apartment, and he did not try to evade capture (as the prosecution claimed). But he was an easy mark, and when evidence surfaced that suggested someone else may have killed the woman – someone local, wealthy, and well-respected – there was no interest in pursuing it. It took almost two decades, and pressure from Conan Doyle, to get Slater’s conviction overturned. There’s a lot in this book about Conan Doyle himself, and about Sherlock Holmes, his iconic detective. Conan Doyle examined the Slater case in much the same way Holmes did in his many stories. Both were specialists in abduction, a method of “thinking backwards” to figure out the truth behind evidence. This part of the book – where Conan Doyle uses abduction to demonstrate the absurdity of the charges against Slater – is a gripping read. And it ultimately saved Slater from his life sentence behind bars. I enjoyed reading this book very much. It’s well-written, meticulously researched, and it shines a light on human nature and prejudice (both in the early 1900’s and today). I highly recommend it – not just to fans of Holmes and Conan Doyle, but to students of history and justice. It’s an engaging read. Conan Doyle for the Defense tell the true story of the violent murder of Marion Gilchrist and the wrongful imprisonment of Oscar Slater for the crime, despite his clear innocence. Conan Doyle created one of the most famous detectives of all literature with his Sherlock Holmes. Yet less well known is that, thanks to Holmes' fame, Conan Doyle himself also occasionally stepped in on cases where he thought he could be of use. Oscar Slater's is one of those cases. The brutal murder of Marion Gilchris Conan Doyle for the Defense tell the true story of the violent murder of Marion Gilchrist and the wrongful imprisonment of Oscar Slater for the crime, despite his clear innocence. Conan Doyle created one of the most famous detectives of all literature with his Sherlock Holmes. Yet less well known is that, thanks to Holmes' fame, Conan Doyle himself also occasionally stepped in on cases where he thought he could be of use. Oscar Slater's is one of those cases. The brutal murder of Marion Gilchrist in 1908 Glasgow was certainly worthy of Holmes himself- a rich, reclusive, elderly lady who lived in a nearly impregnable house was found beaten to dead in that home in the 10 minute window of time when her maid stepped out to buy a paper. Slater never heard of Miss Gilchrist, yet because he had pawned a brooch with a superficially similar description to one stolen at the crime scene he was named the killer. It didn't matter that the brooch had been pawned months before the murder (and its theft), that there was no way Slater knew of the brooch or the woman, that no eyewitness could agree on the man they saw in the neighborhood (or even if there was one or two men). Nor did it matter that almost as soon as they named Slater as a suspect the police knew he had to be innocent. Slater was arrested, tried, convicted, and jailed for nearly 20 years for a crime he couldn't have committed. Margalit Fox tells the story from two angles: following Slater and the crime and following Conan Doyle's attempts to bring to light the farce of justice that was Slater's case. While overall the book is interesting, Fox never seems able to decide what kind of story she's telling. Is this a murder mystery where ominous statements and cliffhangers are needed at the end of every chapter? Is it a biography of two men who only met in person once, but had a deep impact on each other's lives? Is it a new literary critique of Conan Doyle's Holmes and his place in the canon of detective fiction? Is it a history of the development of forensic science and the criminal justice system of Scotland and England? Fox wants the answer to be: yes, it is all of those. The result is an interesting, though often rambling, Conan Doyle for the Defense- a story of crime that is probably more memorable because of the crime that happened after the murder- the criminally negligent (at best) railroading of an innocent man. Although the draw of the story will be, for most people, Arthur Conan Doyle, and though Conan Doyle is on nearly every page of the book, he really had very little to do with the case as a 'case'. The actual murderer is never caught- although Doyle and others on Slater's side had their suspicions. Doyle does not produce the true killer and clear an innocent through any Holmesian insights. What he does that is remarkable for the time is to step above the reflexive prejudice against Slater as a foreigner, a gambler, a Jew, and a scoundrel. Unlike the judge, the jury, supposed 'eyewitnesses' and the general public as a whole, Doyle argued that a man was innocent until proven guilty and should not be a scapegoat for the police simply because they had no other convenient man on hand to blame. The case against Slater was not even built on a house of cards- solid if looked at in the right light. It was as solid as a house of Swiss Cheese. But, as Fox goes into repetitive detail to show, because Slater was Other and could be made to fit the image of the turn of the century bogeyman, he was convicted. An interesting look into turn of the century British criminal justice and morals, Conan Doyle for the Defense is a highly receptive, not always well-written, slightly rambling account of a terrible miscarriage of justice and a stubborn writer's work to help champion the correction of that miscarriage. Despite this, it will be interesting to history lovers (and especially to lawyers) and interesting to those readers looking to discover more about the life of Arthur Conan Doyle. Conan Doyle for the Defence was a real treat for someone who loves historical true crime and into the bargain I got to know a little more about the creator of Sherlock Holmes. The true crime is the brutal murder of Marion Gilchrist. A wealthy elderly spinster who lived in a secure apartment, almost paranoid about her precious jewels being stolen. She was pretty much estranged from most of her family and lived with her maid Helen Lambie in a tightly organised fashion as you’d expect from a woman o Conan Doyle for the Defence was a real treat for someone who loves historical true crime and into the bargain I got to know a little more about the creator of Sherlock Holmes. The true crime is the brutal murder of Marion Gilchrist. A wealthy elderly spinster who lived in a secure apartment, almost paranoid about her precious jewels being stolen. She was pretty much estranged from most of her family and lived with her maid Helen Lambie in a tightly organised fashion as you’d expect from a woman of her class. On 21 December 1908 Helen Lambie left the house to buy the paper and by the time she returned a little more than ten minutes later, her employer was dead. Fortunately Helen, along with the downstairs neighbour had caught a passing glimpse of the murderer and she was also able to identify a missing diamond crescent-shaped brooch. The police were involved and from the passing of time it is clear to see that the man they pursued, a Jewish man called Oscar Slater, was done for all the wrong reasons. Margalit Fox takes us through the anti-Semitic sentiment of the times and the fear of those immoral trades which Oscar also seemed to be caught up in. The author also treats us to an explanation of how easy it is to identify the wrong man, especially if the police kindly give some clues as to who they think is the perpetrator of a crime. To cut a long, but interesting story short, Oscar Slater is convicted of murder and Conan Doyle became interested in the case, but equally interestingly, he didn’t rate the man himself. The author then draws parallels between Conan Doyle’s work as a doctor and the skills needed to solve a crime. Working back from what is known, the symptoms or the body through the absolute facts. Something that didn’t happen with the police work carried out in Glasgow when Marion Gilchrist’s body was found! There are also parallels between Conon Doyle’s deductive skills (I’m not going to mention the lengthy explanation on how he actually practiced abduction) and those of his fictional detective which the author ascribes to his mentor at medical school who used his own keen observations to work out a person’s profession, address and other details from the mud on his shoe or the amount of lint on his hat. I was absolutely fascinated by this read, there was a lot of information and one couldn’t help but wonder how Oscar coped with nearly two decades of being in Petershead prison with his family far away in Germany. When you consider he had no correspondence with them for the entirety of the WWI his fortitude is even more astounding. I find the premise of this book fascinating! I never realized the author of Sherlock Holmes actually did a bit of amateur detective work, making Holmesian deductions on the basis of seemingly scanty evidence! This book told the tale of a particular case Conan Doyle became involved in. Chapter 15, which described the deductions he made in this case, was very good. His deductions were impressive in a way that Holmes's never were, since I always suspected Holmes wouldn't have been so successful in I find the premise of this book fascinating! I never realized the author of Sherlock Holmes actually did a bit of amateur detective work, making Holmesian deductions on the basis of seemingly scanty evidence! This book told the tale of a particular case Conan Doyle became involved in. Chapter 15, which described the deductions he made in this case, was very good. His deductions were impressive in a way that Holmes's never were, since I always suspected Holmes wouldn't have been so successful in real life. Unfortunately, the rest of the book mostly fell flat for me. I feel a lot of sympathy for Slater, who was falsely imprisoned for almost 20 years, but I really didn't need to read every sad letter he wrote to his family from jail. A lot of things were repeated over and over throughout the book, such as the author's hypotheses about why the police continued to pursue Slater despite his clear innocence. (They didn't want to admit they were wrong and lose their only lead, and he matched their stereotypical idea of a criminal.) I got it the first time, no need to keep bringing it up! Such an interesting book! My husband picked it up for me as I am interested in all things Conan Doyle and Sherlockian, and it is a great narrative of a real life case on which CD cleared a man wrongfully convicted. But, unexpectedly, it is also a spot-on treatise on racial profiling and the difference between criminalistics (what we would call today forensics) and criminology (which was a popular theory relating to two primary ideas: one, that criminals were born that way and could not be rehabi Such an interesting book! My husband picked it up for me as I am interested in all things Conan Doyle and Sherlockian, and it is a great narrative of a real life case on which CD cleared a man wrongfully convicted. But, unexpectedly, it is also a spot-on treatise on racial profiling and the difference between criminalistics (what we would call today forensics) and criminology (which was a popular theory relating to two primary ideas: one, that criminals were born that way and could not be rehabilitated; and two, that they could be “detected” by clues related to their class, religion, ethnicity, and even physical appearance). While even the most moronic today would scoff at the idea that someone’s forehead shape or ear size could reveal their character or likelihood of criminal behavior, it is chillingly similar to the tragedies of our age perpetrated upon people of color- black men in particular. CONAN DOYLE FOR THE DEFENSE. (2018). Margalit Fox. ***. Aside from being the greatest detective writer of all times, Conan Doyle was seriously interested in other areas. One of them was the occult, or supernatural. The other was championing lost causes. In this case, he became the champion of a German Jew who was wrongly convicted of a brutal murder of a woman, and sentenced to life in a Scottish prison. I had read of his efforts in this defense before, but it is not well known. 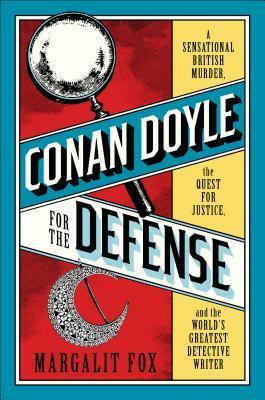 In this review, D CONAN DOYLE FOR THE DEFENSE. (2018). Margalit Fox. ***. Aside from being the greatest detective writer of all times, Conan Doyle was seriously interested in other areas. One of them was the occult, or supernatural. The other was championing lost causes. In this case, he became the champion of a German Jew who was wrongly convicted of a brutal murder of a woman, and sentenced to life in a Scottish prison. I had read of his efforts in this defense before, but it is not well known. In this review, Doyle sifts through all of the relevant data and uncovers clues that have been misinterpreted or lies that have been used by the law enforcement agencies to further their purpose. It is an early example of attitudes towards immigrants and Jews that contributed mainly to his conviction. The story could well have been found as well in today’s world. Ever wonder how Sir Arthur Conan Doyle dreamed up Sherlock Holmes? There are a lot of answers here for you. Conan Doyle trained to be a medical doctor in a time when observation was highly prized. He studied under a doctor who had great diagnostic skills because he observed symptoms and deduced what was wrong with the patient by analysis--backwards from the symptom. Conan Doyle employed this same type of skill in his famous fictional detective. He also used it to help prove the innocence of a man Ever wonder how Sir Arthur Conan Doyle dreamed up Sherlock Holmes? There are a lot of answers here for you. Conan Doyle trained to be a medical doctor in a time when observation was highly prized. He studied under a doctor who had great diagnostic skills because he observed symptoms and deduced what was wrong with the patient by analysis--backwards from the symptom. Conan Doyle employed this same type of skill in his famous fictional detective. He also used it to help prove the innocence of a man convicted of a crime he didn't commit. I am a senior writer at The New York Times originally trained as a linguist, and I've been lucky enough to be able to combine my vocation with my avocation by writing narrative nonfiction books about language. My new book, "The Riddle of the Labyrinth: The Quest to Crack an Ancient Code," the story of the race to decipher the mysterious Bronze Age script known as Linear B, will be published on May I am a senior writer at The New York Times originally trained as a linguist, and I've been lucky enough to be able to combine my vocation with my avocation by writing narrative nonfiction books about language. My new book, "The Riddle of the Labyrinth: The Quest to Crack an Ancient Code," the story of the race to decipher the mysterious Bronze Age script known as Linear B, will be published on May 14, 2013, by Ecco Press/HaperCollins. It is the real-life tale of obsession, a lost civilization, personal tragedy and the step-by-step detective work that goes into unraveling an unknown script from the ancient past. My previous book is "Talking Hands: What Sign Language Reveals About the Mind" (Simon & Schuster, 2007).